Several cartoon collections are available, and S. Harris owns the copyright to all the cartoons in the books. Therefore, it will be easy for you to get reprint permission and reproducible copy. You can purchase S. Harris books online through amazon.com. Click on a link below to go to the page for that title on amazon.com, where you will find a description, ordering information, and more. From preschoolers to emeriti, there are jabs here at education and cultural literacy. Not just talking dogs, but talking anteaters, wart hogs, pigeons, bugs (including a dung beetle), skunks and pigs—but the platypus doesn't say a word. While a chemistry professor explains the periodic law and physics professor diagrams the atom, S. Harris's cartoons help illuminate these fascinating ideas. The Research Mall, Fermat's First Theorem and six Dr. Quark comic strips! Beginning with the famous Miracle and ending with The Meaning of Life, this collection covers just about everything in between. As Darwin slides into third base and Mozart goes digital, Dr. Quark's comic strip pops up every twenty pages or so. This title is out-of-print, but the author has all of the remaining copies. You can purchase them directly from him for $10 each, postage paid. Complete the Contact form, and specify that you are interested in purchasing a copy of this title. Isaac Asimov wrote the introduction to this collection of dog drawings. You may be appalled to discover what Galileo really threw off the Tower of Pisa. Now in its fifth printing, the last page depicts the entire universe in its actual size. Whether you're a Freudian or a Jungian, you'll agree this book is the perfect therapy. Did Orville Wright want to eat airline food? Do you get T-Mail from your toaster? Ever call in the company optimist? From the high crime area where kickbacks and price fixing are rampant to the illegal aliens from Mars, the law is lambasted here. You've heard of Hippocrates. Here you can find the father of the upward spiral of health care costs. In this outrageous send-up of global warming, Sidney Harris and his cartoonist colleagues comment on today's most inconvenient truths. Click here for more information and sample cartoons. If you're overwhelmed by the mess we've made of our environment, stretch out under a tree (remember them?) with this collection. Aside From the Cockroach, How Was Everything? 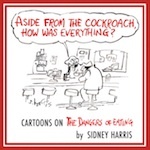 The latest S. Harris collection---on a subject of interest to anyone who eats! From a greasy spoon's wellness special to gourmet leftovers, you'll find many surprises on our menu.